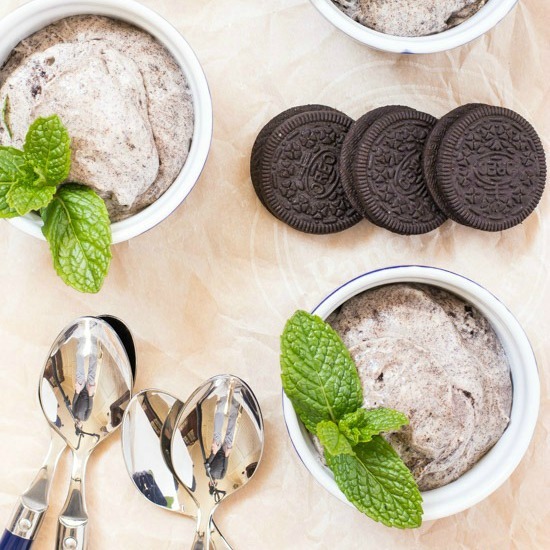 Just four ingredients is all you need to make this low fat Oreo fluff dessert recipe. 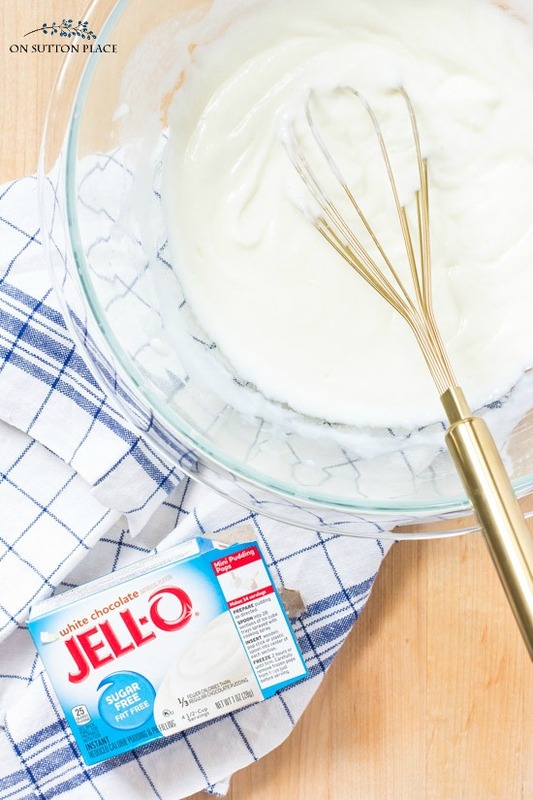 This easy make-ahead dessert is kid-friendly and delicious! If you love Oreo cookies, have I got a sweet treat idea for you! 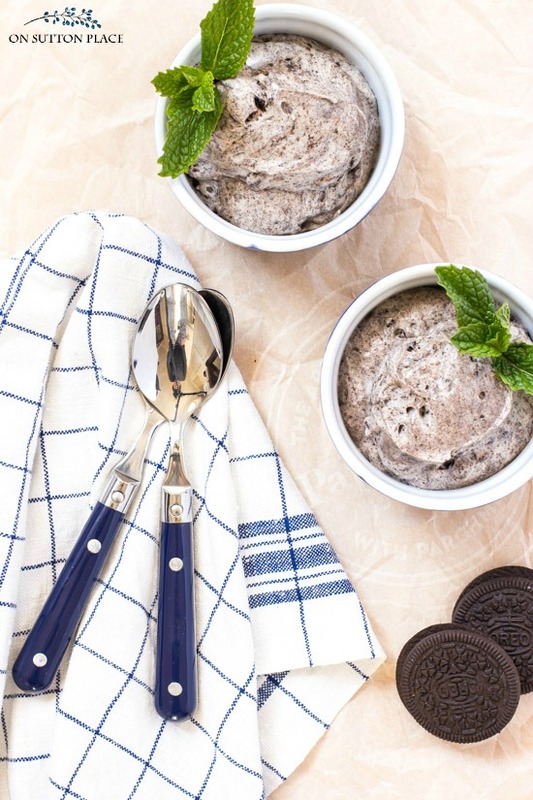 This low fat Oreo fluff dessert recipe is so many good things. Low fat, no-bake, easy, fast, and last but not least, delicious. I have seen several versions of this recipe on Pinterest and other recipe sites, but this version is different. I substituted low fat items for the basic ingredients and the end result is a fluffy, creamy dessert. There are two more really nice things about this low fat oreo fluff dessert recipe. The first is that it can (and should) be made a day ahead so it’s perfect for parties or family gatherings. The second is that it lasts in the refrigerator (covered) for up to four days. Chances are it won’t last that long though! 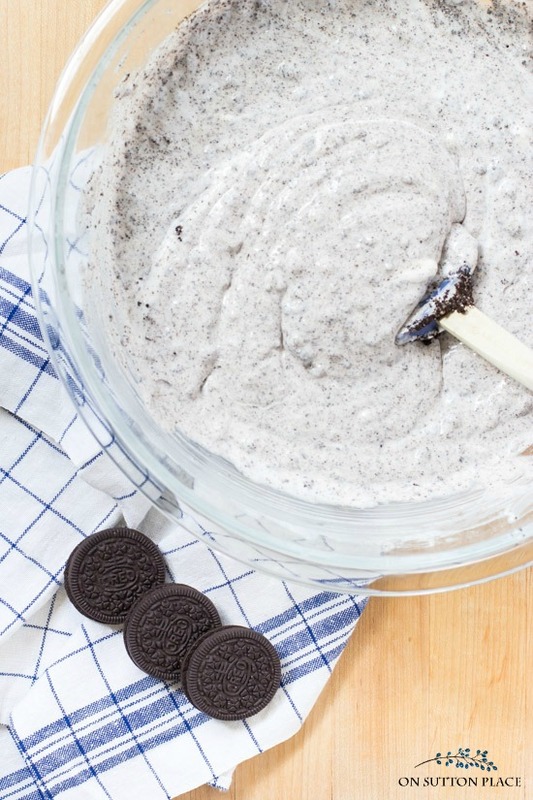 Just four ingredients is all you need to make this low fat Oreo fluff dessert recipe. This easy make-ahead dessert is kid-friendly and delicious. Empty the box of pudding into a large bowl or the bowl of a standing mixer. Add the milk and mix for 2 minutes. Use a whisk or the whisk attachment of the mixer. Place the cookies in a ziploc bag and crush with a rolling pin. Add crushed cookies to pudding mixture. Refrigerate several hours or overnight, covered. Scoop into ramekins or small bowls to serve. 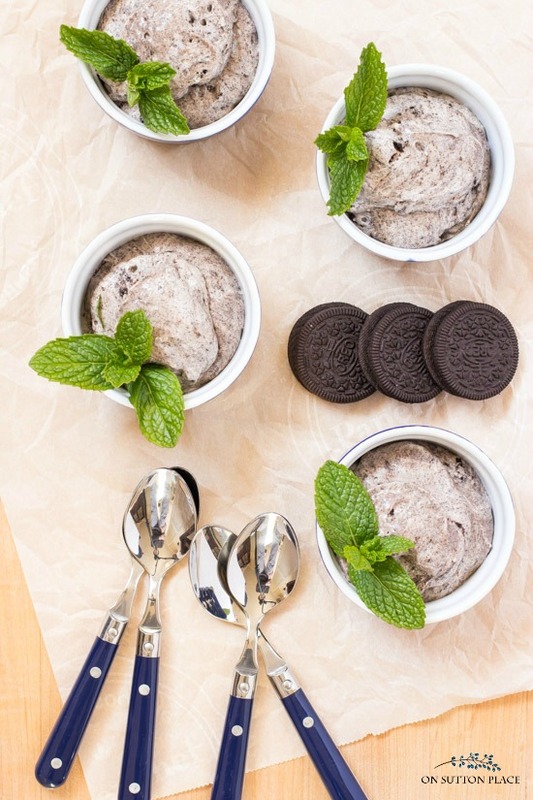 Garnish with mint and an Oreo cookie. I used a two inch scoop and made my serving sizes about 1 1/2 scoops each. I got ten servings from one recipe. A very rough calorie estimate would be 185 calories per serving and 3.5 grams of fat. If you make bigger or smaller servings, those numbers would vary. If you aren’t counting fat grams or calories, this fat free Oreo fluff dessert recipe would be delicious served in a puff pastry shell or a graham cracker crust. Either way, on it’s own or dressed up a bit, this sweet kid-friendly treat is a winner. Today your blog was filled with everything I love! 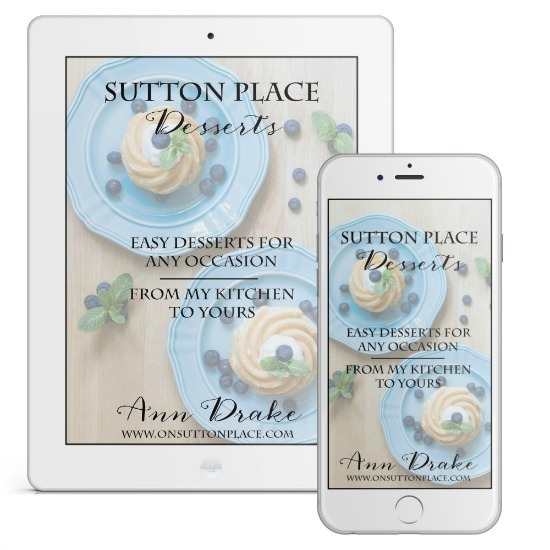 From the spring decor to all of your fabulous recipes, old and new! I am so inspired in every way. 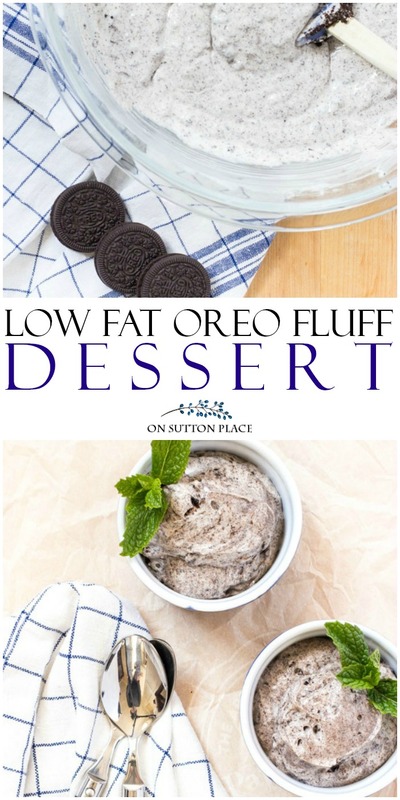 I made this LOW FAT OREO FLUFF DESSERT RECIPE, so good! How often can you make it and still consider it low fat! My husband fills a bowl, not a ramekin either, if you can picture it. Gone. I love the idea of the Oreo Fluff Dessert. I have a question though – what is “fat free whipped topping” ? I live in South Africa and we don’t have any such thing. Would whipped cream be a substitute and if so how much ? If you can help, I’ll give it a bash ..
Hi Jennie! The brand name here in the US is Cool Whip. It’s in the freezer section usually by the frozen pies & cakes. I honestly don’t know if the whipped cream would hold up. The fluff is really better after it refrigerates for several hours or overnight. If you decide to try it…let me know! Love this idea, and wondered why would it have to be Oreos! Ginger Snaps would be amazing!! Thank You Ann for the yummy recipes! I will be making the Carrot Cake and the Toasted Coconut Nest cupcakes, they both sound wonderful especially for the holidays. Yummmmm! What a delicious dessert idea, we would love this SO much! I love that you added Oreos…my fave!! Thank you for this recipe! I’ve had Oreo Fluff at a local salad bar and it is delicious! I had no idea how to make it, but figured it couldn’t be too hard. Now having your low-fat recipe makes it a sure-bet that I’ll have it served here at home! You had me at Oreo! I could get into so much trouble with this. Thanks for sharing your recipe, Ann! Looks like pure dessert comfort food! Oh yum, even better that it is low fat, can’t wait to try it! This looks so delicious, Ann! Definitely pinning this to give it a try – my boys would love it! Thanks for being part of this tour and series! Can’t wait to try it! I have (grown up) kids who love Oreo desserts! Thank-you for brightening my morning Ann! I was having a rough start to my day and The Lord blessed me with your happy post. Have a great day!